Thanks a lot for Saket and Team for Making my PMP journey a great Success. Will share the details in next post as I am at airport now. Joining weekend webinar. Congratulations Vijay!! I am eagerly waiting your exam lesson learned. Thank you Seema and Jyoti. 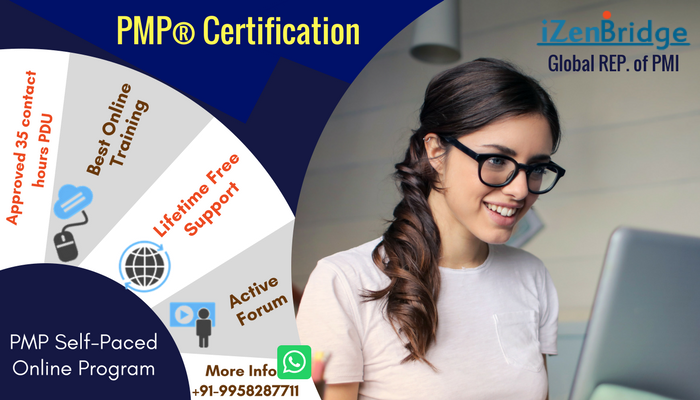 I passed my PMP exam on 19th July 2018 in my second Attempt. I was not able to Make in first attempt as my preparation was not enough and due to year-end hectic schedules in Office. After joining IZEN Bridge i got confidence with the subject part. Thanks a Lot to Saket for excellent explanations of each and every topic. I thought that it would be much better if Saket has dissected more on ITTOs as any exam taker will be much more worried on that part. but that's fine and sufficient for the exam with what Saket had explained.Try to understand the Intent of ITTOs rather than remembering. > 70% of the questions are on communications, Risk, procurement, Stakeholders. > 30% were on Remaining Knowledge areas. > No questions on HR theories, resource optimization and chapters 1-3. > Only 1 direct ITTO situational question on Risk management, only 1 problematic question on Critical path that too not diagrammatic , 1 on Beta distribution(straight question) and 1 question on EVM for EAC calculation that to simple (BAC/CPI formula). > I expected some graphical and problematic questions which were easy to score but no luck. All are Complete theoretical Situational questions. >Studied 3-4 hours daily Max. >Only PMBOK and Only PMBOK6 is my suggestion - i read for 2 times and 2nd time is only important points marked in PMBOK in first reading. >Read Rita for Resources, Communication, Procurement only as it has much better explanations than PMBOK. > Exam will be more or less like chapter end questions in the IZEN BRIDGE online course and I have gone through them 2 times for all knowledge areas. As Manish said don't do it immediately after completed reading KA's. Do it after 1 week of studying KA chapter. >Never attempted single MOCK as i felt i would be discouraged. I concentrated only on grasping subject and 1 hour assessments as much as possible.I have endurance to sit continuously for 4-5 hours as in office i would do the same (*day before exam on 18th morning there was a twist in my health and i had severe low back sprain and i was not able to move and i lost hopes for exam and i confirmed that. I dint even have any assistance as i had traveled from visakhapatnam to Hyderabad and finally Apollo hospital team helped me with physiotherapy and medications and i was able to complete my exam successfully without complete sleep in the night due to pain . Thanks a LOT once again for the saket AND IZEN Bridge PMP training team for giving me such a confidence to attempt PMP exam. Thanks for sharing your detailed exam lesson learned! !